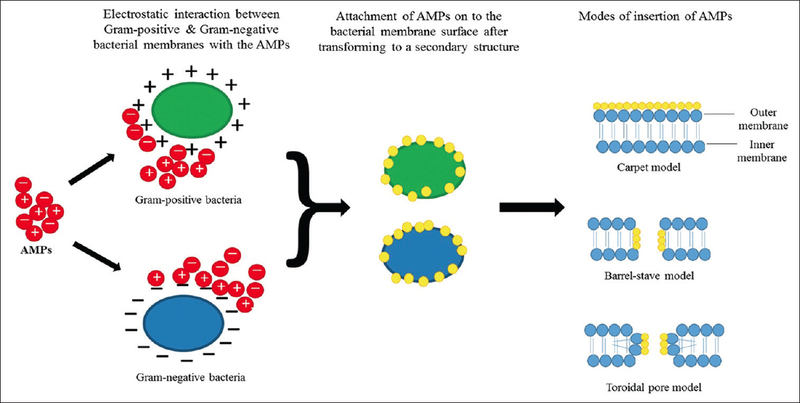 Antimicrobial peptides (AMPs) are biological molecules bridging the innate and acquired immune systems of the defense mechanism. They have been found to be effective against not only Gram-positive and -negative bacterial species but also fungi and viruses with their broad spectrum of activity. Among the various niches where they are found in the human body, in the oral cavity, the AMPs are secreted by the epithelial cells, defense cells, crevicular fluid, and in the salivary secretions and form the first line of defense against bacterial invasion. The present review gathers information from a number of literature reviews, systematic reviews articles, and original research work to come to a conclusion regarding the use of AMPs. AMPs are miraculous in that they either do not or develop resistance very slowly and hence are supposed to be great candidates for developing antibiotics. Their use in mouthwash formulations, topical applications, etc., as therapeutic modalities has found some success in the past but is still undergoing trials. In periodontal disease, their active role as biomarkers by the relative upregulations and downregulations during disease progression has also been recognized. The early recognition of these biomarker changes can help regulate the progression of periodontal diseases. They also control the development and progression of biofilm formation and might potentially contribute toward the development of therapeutic mimetics, probiotics, and antibiotics in the near future. Background: The aim of this systematic review was to evaluate whether patients with gingival recession would benefit from an acellular dermal matrix graft (ADMG) in ways that are comparable to the gold standard of the subepithelial connective tissue graft (SCTG). Materials and Methods: A systematic review and meta-analysis comparing ADMG to SCTG for the treatment of Miller Class I and II recession defects was conducted according to PRISMA guidelines. PubMed, Excerpta Medica Database, and Cochrane Central Register of Controlled Trials databases were searched up to March 2016 for controlled trials with minimum 6 months duration. The primary outcome was root coverage; secondary outcomes included attachment level change, keratinized tissue (KT) change, and patient-based outcomes. Both authors independently assessed the quality of each included trial and extracted the relevant data. Results: From 158 potential titles, 17 controlled trials were included in the meta-analysis. There were no differences between ADMG and SCTG for mean root coverage, percent root coverage, and clinical attachment level gain. ADMG was statistically better than SCTG for gain in width of KT (−0.43 mm; 95% confidence interval: −0.72, −0.15). Only one study compared patient-based outcomes. Conclusion: This review found that an ADMG would be a suitable root coverage substitute for an SCTG when avoidance of the second surgical site is preferred. Background: Association of neutrophil function abnormalities with localized aggressive periodontitis (LAP) has been reported in Indian population. There are no published studies on the familial aggregation of aggressive periodontitis (AP) and neutrophil function abnormalities associated with it in Indian population. The present study aimed to assess neutrophil chemotaxis, phagocytosis, and microbicidal activity in AP patients and their family members of Indian origin, who may or may not be suffering from AP. Materials and Methods: Eighteen families with a total of 51 individuals (18 probands, 33 family members) were included. Neutrophil chemotaxis was evaluated against an alkali-soluble casein solution using Wilkinson's method. Phagocytosis and microbicidal activity assay were performed using Candida albicans as an indicator organism. Statistical Analysis Used: The magnitude of association between the presence of defective neutrophil function and LAP or GAP was calculated using odds ratio and relative risk. Total incidence of AP, and in particular, LAP in the families attributable to the presence of defective neutrophil function was calculated by attributable risk. Results: The association between depressed neutrophil chemotaxis and presence of AP and LAP or GAP in all the family members (n = 51) was found to be significant (P < 0.05) while that for phagocytic and microbicidal activity were observed to be nonsignificant. Conclusion: The results of the present study suggest high incidence of AP (LAP and GAP) within families was associated with depressed neutrophil chemotaxis. High prevalence of depressed neutrophil chemotaxis in the family members (61%) of LAP probands exhibiting depressed chemotaxis suggests that the observed abnormalities in neutrophil functions may also be inherited by the family members. Background: Periodontitis and atherosclerosis represent a chronic inflammatory process. The incidence of periodontitis in cardiac patients with atherosclerosis is a well-established fact. The role of viruses in the etiopathogenesis of both has been proposed. Aim: The aim of the study was to evaluate the prevalence of Torque Teno virus (TTV), Epstein–Barr virus (EBV), and cytomegalovirus (CMV) in cardiac patients with atherosclerosis and coexisting chronic periodontitis (CP). 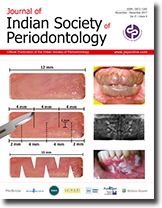 Materials and Methods: Thirty patients (17 males and 13 females) with atherosclerotic plaques and coexisting periodontitis were recruited for this cross-sectional study. Viral DNA was extracted from the subgingival and atheromatous plaque. The presence of CMV, EBV, and TTV in the plaque samples was identified using polymerase chain reaction. The collected data were statistically analyzed for the prevalence of the viruses and Chi-squared test was performed to find out its association with atheroma and CP. 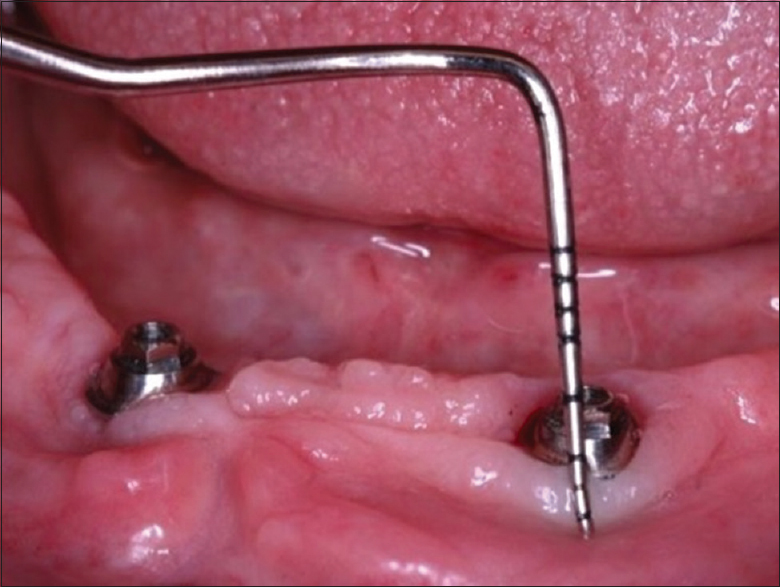 Results: The prevalence of CMV, EBV, and TTV in atheromatous plaque was 63.3%, 56.7%, and 46.7%, respectively, as compared to rates of 80%, 63.3%, and 53.3% in subgingival plaque. Results also indicated no significant association of CMV, EBV, and TTV in both samples (P = 0.08, 0.346, and 0.261, respectively). Conclusions: There was no significant association of CMV, EBV, and TTV between subgingival and atheromatous plaque. The prevalence of CMV, EBV, and TTV was high in atheromatous plaque. TTV was isolated from more than 50% of participants in atheromatous plaque, which is a significant finding. Background: Osteoporosis is particularly high in females, the early identification of which remains a challenge. Panoramic radiographs are routinely advised to detect periodontal diseases and can be used to predict low bone mineral density (BMD). 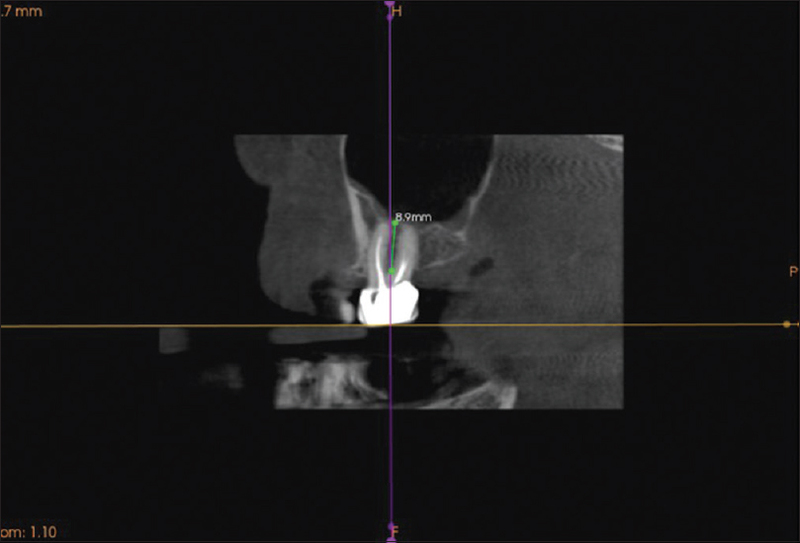 Hence, this investigation was aimed to identify the risk of osteoporosis in pre- and postmenopausal periodontally healthy and chronic periodontitis women with digital panoramic radiographs. Materials and Methods: The study population consisted of 120 patients equally divided as Group I - Premenopausal periodontally healthy, Group II - Premenopausal periodontitis, Group III - Postmenopausal periodontally healthy, and Group IV - Postmenopausal periodontitis. Clinical parameters were recorded, and digital panoramic radiographs were used to record the mental index (MI), panoramic mandibular index (PMI), and mandibular cortical index (MCI) scores. Results: MI was found to be varied, and the differences were highly significant among Group III and IV (P = 0.0003) and Group II and IV (P = 0.0007), and significant difference was found between Group I and Group II (P = 0.0113). MCI evaluation showed a greater prevalence of C2 and C3 patterns among postmenopausal women. MCI correlation with MI (P < 0.0001), PMI (P < 0.0001) and age (P = 0.0029) indicated a highly significant variance. Conclusion: The positive association between MCI and chronic periodontitis in postmenopausal women confirms the high risk of osteoporosis in them. Furthermore, an increased percentage of patients with undetected decrease in BMD may be identified by screening with digital panoramic radiographs which are done on a routine basis for periodontal and other dental diseases and thus could be used as an effective aid to quantify bone density in future. Background: For dental implant planning in maxillary posterior region, it is essential to know their relationship with maxillary sinus. Maxillary posterior teeth affected by chronic periodontitis usually have a poor prognosis, ultimately leading to tooth loss. Following tooth loss, significant bone resorption occurs resulting in compromised remaining bone support for dental implant placement. Aim: The study aims to determine the relationship between inferior wall of maxillary sinus and the root apices of maxillary posterior teeth. Materials and Methods: The study sample consisted of cone-beam computed tomography images of 150 patients. Vertical distance between inferior wall of maxillary sinus and root apices and furcation area of maxillary posterior teeth as well as crest of the edentulous ridge were measured in periodontally healthy individuals (Group 1), chronic periodontitis patients (Group 2), and in patients with edentulous maxillary posterior region (Group 3). The data were analyzed using one-way analysis of variance and Tukey's test to compare mean distances between groups and molars. Results: There was a significant difference in mean distances between Group 1 (3.067 ± 1.600), Group 2 (1.602 ± 0.536) and Group 3 (1.279 ± 0.476) (P = 0.00001) and between mean distances of four sites (7.101, 0.932, 0.903, and 0.402 mm) (P ≤ 0.05). There was no significant difference in mean distances between the first and second molars (2.1469; 2.0996) (P = 0.787). Conclusion: For planning of dental implant placement in maxillary posterior region, the clinician should consider the vertical relationship between maxillary sinus floor and root apices of maxillary molars. Background: The poor hygiene of peri-implant tissues causes inflammation at tissue-implant interface, which may impair the rehabilitation success. The aim of this study was to evaluate the influence of external hexagon and Morse taper implants on peri-implant health in patients wearing mandibular overdentures for 1 year. Materials and Methods: A total of 46 implants were evaluated, 28 external hexagon and 18 Morse taper. Plaque index in the mini-abutment, bleeding index, peri-implant inflammation, keratinized mucosa zone, probing depth, and marginal mucosa level were evaluated after 3 months and 1 year of prostheses insertion. Results: Deeper probing was found in the external hexagon group compared with Morse taper (P = 0.024) after 1 year of rehabilitation. Although the Morse taper group exhibited worse scenario of peri-implant inflammation than the external hexagon group (P = 0.001), both groups showed reduced inflammation after 1 year. A larger keratinized mucosa zone was observed with external hexagon implants (P = 0.020). No significant difference was found between the groups for plaque index in the mini-abutment, bleeding index, and marginal mucosa level. Conclusion: In a follow-up period of 1 year, it was concluded that the external hexagon group had a larger probing depth than the Morse taper group. However, better periodontal conditions about inflammation and keratinized mucosa zone were found in external hexagon implants. It was found no influence of implant platform on plaque index in the mini-abutment, bleeding index, and marginal mucosa level. Background: To evaluate and compare the effect of curcumin (CMN) mouth rinse with chlorhexidine (CHX) mouth rinse on clinical parameters and reactive oxygen metabolites (ROM) levels in participants with chronic gingivitis. Materials and Methods: Thirty plaque-induced generalized chronic gingivitis participants were randomly assigned to three groups – Group I (control/saline), Group II (CHX), and Group III (CMN), respectively. Baseline plaque index (PI), gingival index (GI), and salivary ROM were estimated, and oral prophylaxis was done. The parameters were recorded and evaluated again at the end of 4 weeks. Results: Overall, the three groups have shown a significant reduction in PI, GI, and ROM levels at the end of 4 weeks. However, on intragroup comparison, only CMN group have shown significant reduction in ROM levels at the end of 4 weeks (P < 0.05). Conclusion: CMN mouth rinse can be considered as an alternative antigingivitis agent to CHX because of its anti-inflammatory and antioxidant properties. Background: A split-mouth longitudinal study was designed here to evaluate the effect of ozonated water delivered subgingivally through a jet device (Kent Ozone dental TY 820 jet) in controlling gingival inflammation of patients undergoing fixed orthodontic therapy. 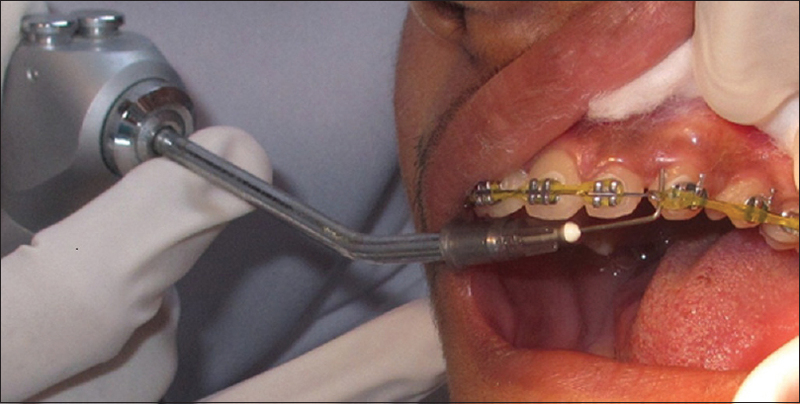 Materials and Methods: Twenty-eight patients undergoing fixed orthodontic treatment following thorough oral prophylaxis were recalled after 2 weeks, and baseline gingival inflammation was estimated. This study was conducted as split-mouth technique with the upper left quadrant (Control side) was irrigated by jetting saline into sulcus by air–water syringe with gauge 22 needle tip and upper right quadrant (Test side) irrigated with ozonated water by a jet device using similar delivery tip. The patients were recalled at the end of 1st, 2nd, 3rd, and 4th month and the irrigations as well as gingival inflammation estimation were repeated. 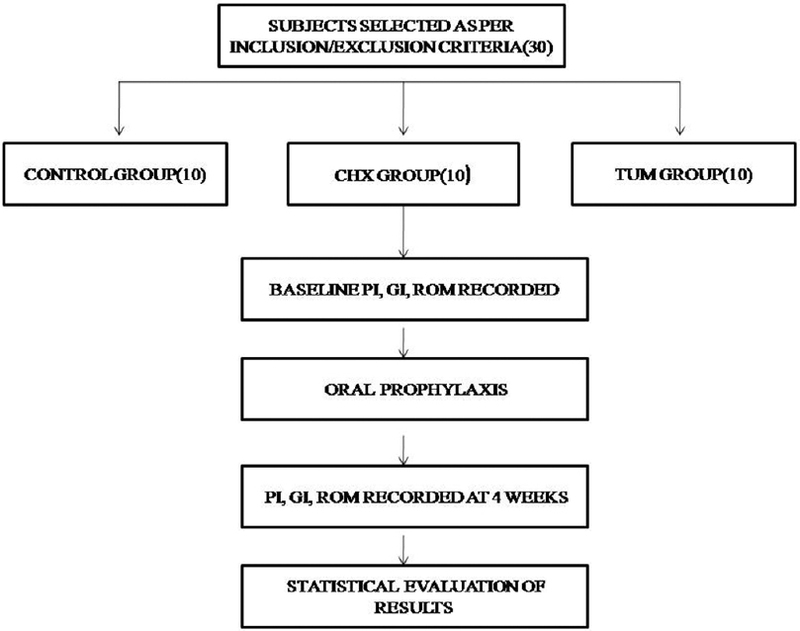 A biochemical assessment of gingival inflammation (estimation of aspartate aminotransferase [AST] in gingival crevicular fluid [GCF]) and clinical assessment (gingival index scoring) was done at each visit. Results: At the test side, the AST level in the GCF was found to be maintained almost the same value as baseline till the end of 4th month, indicating not much of change in inflammatory status. Statistically significant difference in GCF-AST and gingival index score between test and control sites were found at the end of 3rd and 4th month with a significance of P < 0.05. Conclusion: The patient undergoing fixed orthodontic treatment showed a consistent improvement in gingival inflammation on frequent irrigation with ozone jet irrigation as compared with saline irrigation delivered with same jetting force. Background: The differences in the oral health status between the individuals with a high socioeconomic status (SES) and those with a low SES had markedly increased. There is, however, minimal information available on women understanding the need of dental hygiene for overall health and whether pregnant women comply with the current oral health strategies. In Lieu with the above, the present study aims to assess the awareness, dental hygiene practices, and the frequency of dental visits during pregnancy in postnatal women who delivered preterm low birth weight babies of different SES in and around Puducherry. Materials and Methods: A total of 200 individuals who visited Rajiv Gandhi Maternity Centre, Puducherry for delivery were selected. Information regarding onset of prenatal care, referral to dentist, and oral hygiene habits such as frequency of brushing, type of brush used, method of brushing, and frequency of brush change were obtained. Periodontal health status was recorded using PSR system. Results: Awareness of oral hygiene practices was more among upper middle class and lower middle class compared to upper lower strata. Visit to dentist during perinatal period was high among upper middle class compared to other socioeconomic strata. Conclusions: The awareness of oral health-care practices and importance of oral care during perinatal period were less among low socioeconomic strata. Context: Human leukocyte antigens (HLAs) have an important role in the determination of susceptibility and resistance to periodontal diseases in humans, which may vary from population to population. 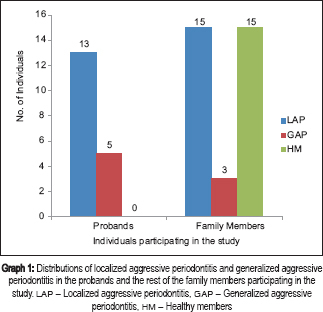 Aims: The aim of this study was to find out the association of HLA Classes I and II genes with chronic periodontitis in East Indian population. Materials and Methods: In a cross-sectional study design, a total of sixty participants of chronic periodontitis (CP) (mean age: 44.12 ± 5.85) and sixty subjects of periodontal disease-free controls (NP) Periodontitis free controls (mean age 41.85 ± 7.71) were analyzed for their various HLA combinations using serologic (microlymphocytotoxicity test) method. The results are further compared with the HLA profile of 100 samples of blood donors for which periodontal status was unknown. All the data were statistically analyzed by applying Chi-square test, Results: HLA-B7 (P = 0.003), DR7 (P = 0.001), DR53 (P = 0.001), and DQ3 (P = 0.001) were identified as susceptible phenotypes to CP, whereas HLA-A1 (P = 0.010), A3 (P = 0.001), and Cw4 (P = 0.001) phenotypes were identified to be associated with disease resistance. Conclusion: The HLA-B7, DR7, DR53, and DQ3 alleles may represent as risk factors for CP in Eastern Population of India, whereas HLA-A1, A3, and Cw4 may indicate to protective factors for CP of the same. Correct diagnosis of white lesions of the oral cavity is sometimes difficult, because some oral white lesions behave differently and tend to change their appearance with time. 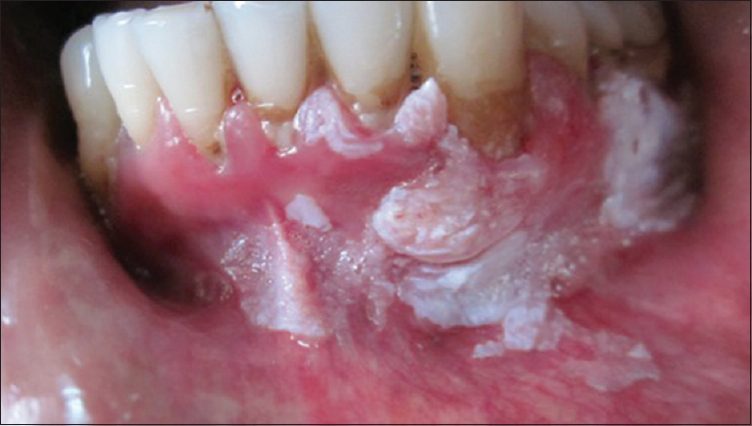 Clinicians often wrongly diagnose such lesions as oral leukoplakias and treat simply. Lesions recur and turn malignant. Proliferative verrucous leukoplakia (PVL) is a distinct form of oral leukoplakia characterized by a high recurrence rate and high rate of transformation into oral squamous cell carcinoma. We present herein a case of PVL which was misdiagnosed as oral leukoplakia and progressed to oral carcinoma. 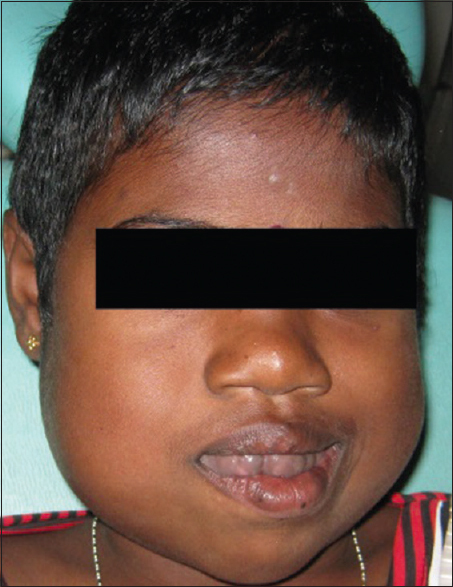 Cherubism is a congenital childhood disease of autosomal dominant inheritance. It is a benign, familial giant cell lesion characterized by gradually progressive painless swelling of the jaws. Idiopathic gingival enlargement is a rare condition and may be associated with some uncommon syndromes. 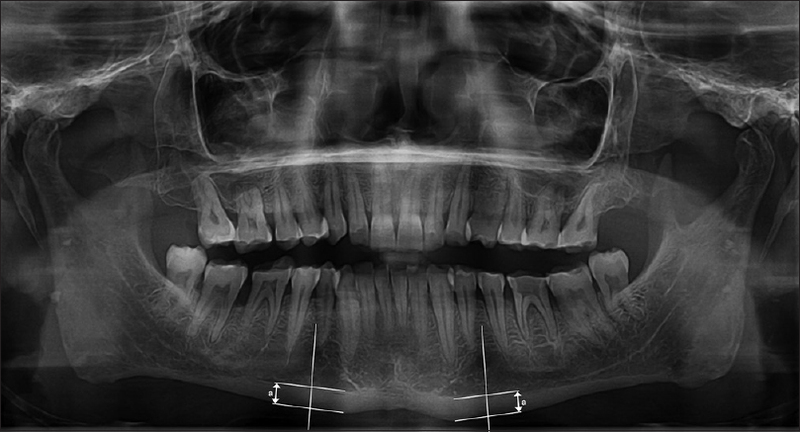 This case report describes an 11-year-old patient with unusual clinical form of gingival enlargement, cherubic facial appearance. Clinical examination revealed the presence of the hyperplastic gingiva, which completely covered all teeth. The bilateral swelling of mandible and the appearance of the sclera beneath the iris suggested cherubism. The diagnosis was confirmed by histopathological examination, which revealed multinucleated giant cells. Computed tomography scan showed multiple osteolytic zones in the mandible. A full mouth gingivectomy was performed in four stages. Lesion healed successfully, and no recurrence observed after 1-year follow-up. There was a marked improvement in esthetics and function through the surgical excision of the overgrowth. The field of periodontal plastic surgery is always a subject of fascination for periodontists, and the importance of pink esthetics is gaining its pace. Preservation of what is existing is more important than its replacement. The same principle also applies to soft-tissue esthetic procedures thereby the concept of minimal surgical invasion came into existence. This article presents a series of five cases with 18 recession sites which were treated with a minimally invasive Pinhole Surgical Technique which resulted in overall root coverage of 96.7% after 6-month follow-up with minimal complications. 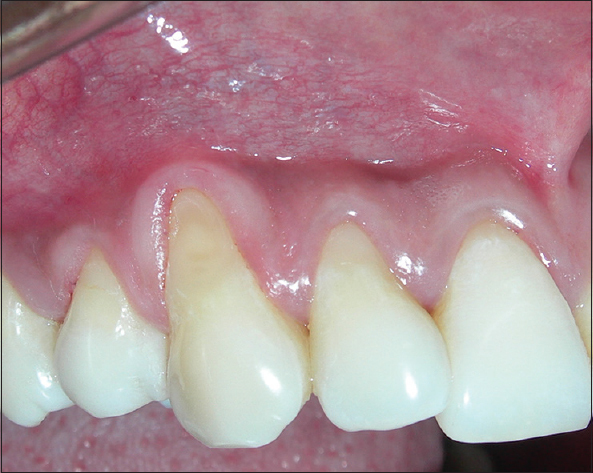 This case report demonstrated a modified technique of free gingival graft (FGG) aiming to increase keratinized attached tissue in large recipient areas. A FGG to increase the amount of attached gingival tissue, facilitate oral hygiene, and prevent further clinical attachment loss was realized in two patients. Because the extensive recipient area, a modified technique was performed to obtain a smaller graft of the donor area. A template of the graft was made about 25%–30% smaller than the total recipient area. After graft removal, interspersed incisions were made in the upper and lower edges of it. After 9–24 months of follow-up, the final width of the keratinized tissue was 4.0–4.4 times larger in comparison to initial clinical condition. In conclusion, this FGG technique can be considered an alternative to gain sufficient amount of keratinized gingival tissue using a smaller graft.